Last year, Italian astronaut Luca Parmitano nearly drowned in his own fluids during a harrowing spacewalk-gone-wrong. 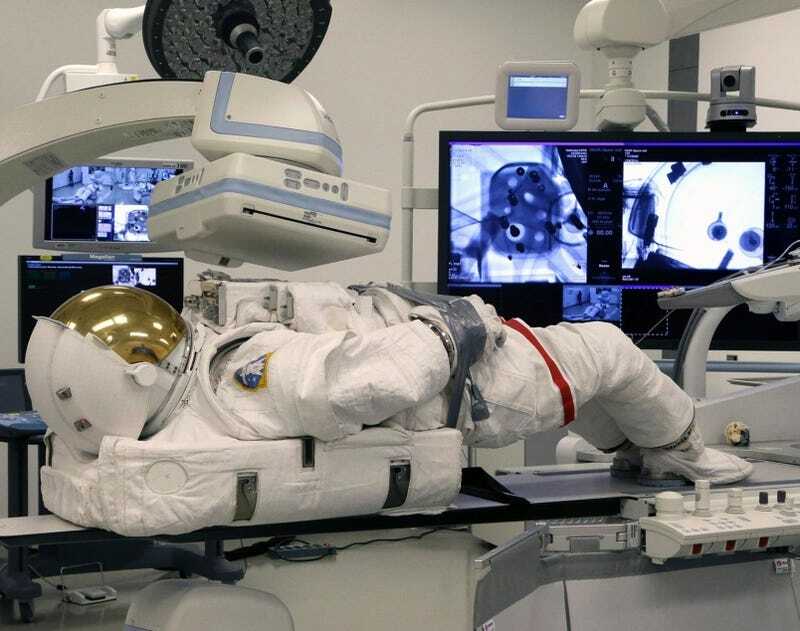 Now, NASA has teamed with the Houston Methodist Hospital's research institute to make sure that such a thing never happens again—using a CT scanner. If you don't recall the crisis, here's what happened: Parmitano's emergency stemmed from a clogged pump inlet pipe fan, resulting in the accumulation of condensation and sweat inside his helmet that rapidly spread to partially cover his mouth and nose. NASA conducted a series of exams on the suit once it had returned from orbit but the standard X- and N-ray imaging systems that the space agency usually employs couldn't produce images clear enough to really tell the team why the part failed or which other parts may fail in the near future. That's where Houston Methodist's robotic CT scanner comes in. During a recent "Pumps & Pipes" industry conference, Dr. Alan Lumsden, the medical director of Methodist's DeBakey Heart and Vascular Center, demonstrated how the technology—which normally examines the vascular structure of the human body—could be leveraged to examine the internal structures of a spacesuit.